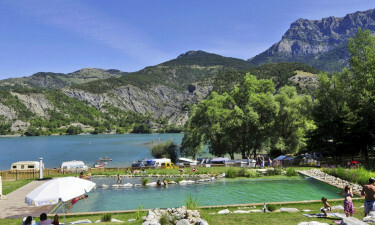 Luxury Camping at the foot of a mountain and the banks of a lake. 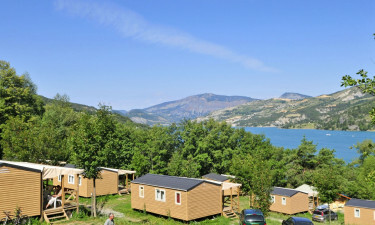 Renting a mobile home at Le Lac with LuxCamp lets campers enjoy the extraordinary panorama of the Southern Alps and Lake Serre-Ponҫon. This luxury camping site ensures that its campers derive maximum benefit from the activities offered by their surroundings including paragliding, water skiing and mountain biking. Because of its location, the holiday camping site of Le Lac provides campers with an extensive and diverse range of activities both on-site and nearby. Swimming and paddling pools, a playground for children and a multi-sports ground are just part of what keeps them happily entertained within the campsite. Camping luxury at Le Lac includes a pool area with a heated outdoor pool and paddling pool. A further feature is a whirlpool with a Jacuzzi, which also provides for the disabled. If the nearby salt-water lake and the swimming pools are not enough, then the soft, warm sands of a Blue Flag beach with its turquoise ocean is a mere 5km away from the campsite.